What we didn’t know at first was, we were talking with the owner. She was helping us order, explaining things and just trying to make sure our first visit was perfect. Well, thanks, because you did just that. 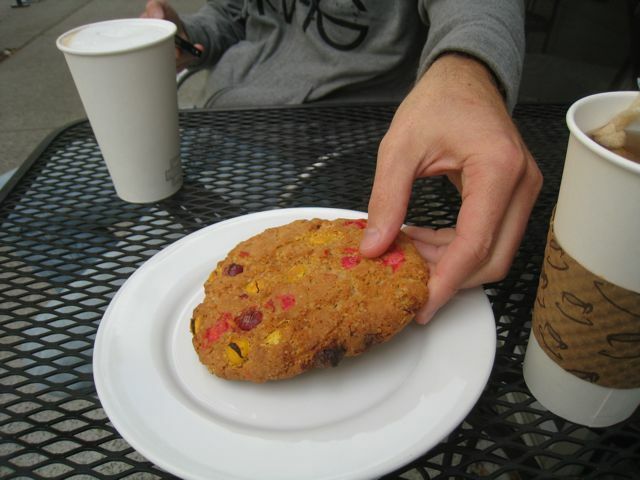 The owner was cooking the sandwiches, so we did have to wait awhile for our food, but that didn’t matter, because we had our tea, coffee and huge cookie. Yep, we had a cookie for breakfast, before our food came. The only reason why she brought it out so soon is because it was still warm. See? Love. We waited for our food because she was making each sandwich as they were ordered. Let’s get down to the good stuff, the food. We both ordered the breakfast sandwich. Mine had bacon and avocado. My husband got bacon and ham. Each sandwich came with tomato, spinach, pesto and balsamic vinegar. 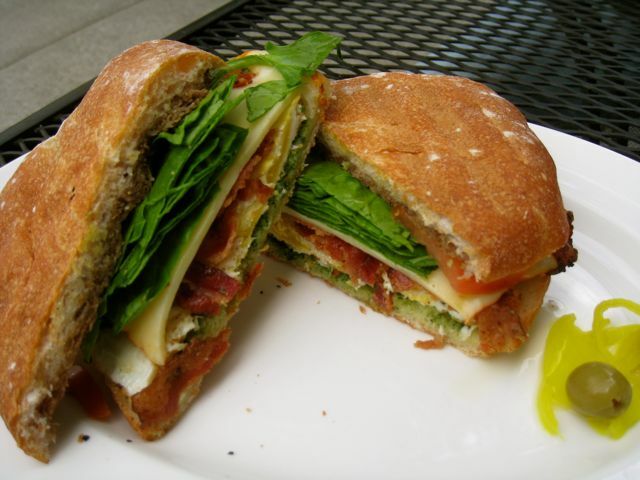 If you have never had a pesto on a breakfast sandwich, you have not lived. Some of my favorite benedicts have pesto. 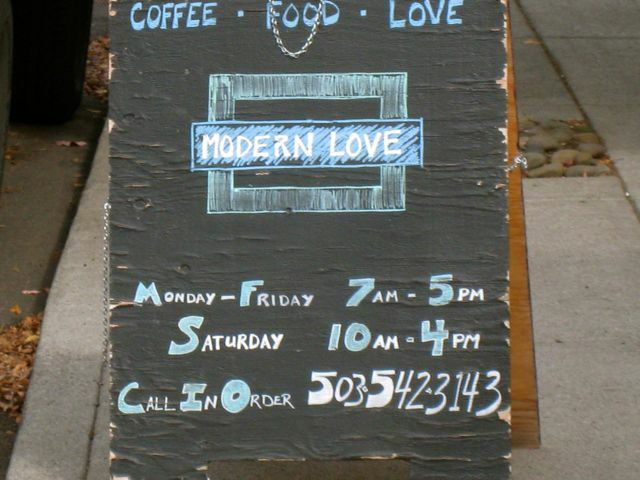 Modern Love is a coffee shop that reaches the locals in the area. But it was enough of a fun find that we will be back. 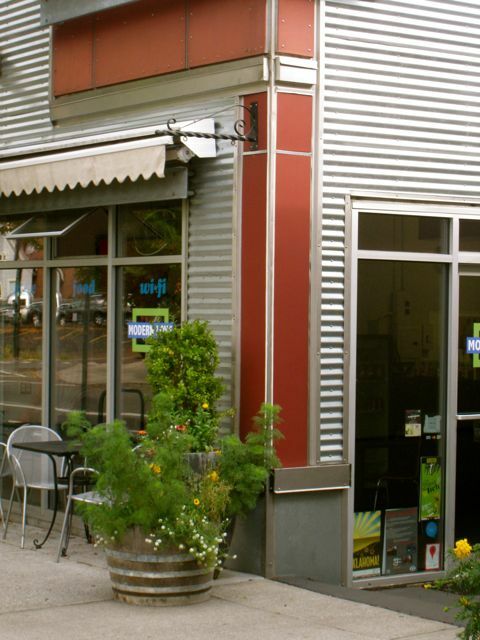 The biggest reason is, we love supporting these kind of small, personal coffee shops. UPDATE :: We went back again. This time we tried the regular lunch paninis. I got the Bacon, Chicken Avocado, per their recommendation, and it was really good. Juicy chunks of chicken with all the toppings and balsamic vinegar on top. Simple, yet tasteful. It was the quick lunch we needed today. Pricing was really affordable. We needed to spend $20 to use our Restaurant.com coupon and it took ordering lots of extras to get it that high. Everything was priced really well. Tea was Jasmine Pearl, which is a great tea. It’s loose leaf that they put in a bag for you. Great flavor. Not sure what the coffee was, but my husband liked it. Locate in the NW District. They have a 17th street address, but they face 18th street on the corner of 18th and Lovejoy.